Presidio Nuestra Señora de Loreto de la Bahia (La Bahia) was built in 1749 on a hill just south of present-day Goliad. La Bahia was one of the major links between Mexico and east Texas and was the principal military post between San Antonio and the Rio Grande. The original presidio had wooden buildings and grass huts which were eventually replaced with stone buildings and a surrounding stone wall. The stone wall is roughly one story in height and encompasses a parade ground in the shape of a quadrangle. The reconstructed buildings within the quadrangle include soldiers' quarters, offices, storehouses, workshops and an arsenal. In the northwest corner of the quadrangle, Our Lady of Loreto, a mission church, was built between 1775 and 1790. Constructed of stone the church has an arched entrance, massive bell tower and a large hand-painted mural covering the wall behind the altar. The chapel was reconstructed in the 1920s and other buildings and the outer wall were reconstructed between 1963 and 1967 by a private foundation. In 1836 during Texas' War of Independence, Texian troops under the command of Col. J.W. Fannin evacuated La Bahia and were caught out in the open and taken prisoner. All 400 were executed. This, along with the defeat at the Alamo, was used as a rallying point to win sympathy for Texas' fight for independence. In 1850 La Bahia was sold to Judge Pryor Lea who used the chapel as a residence. The buildings were eventually abandoned and fell into disrepair. Today the reconstructed La Bahia serves as a museum of life in an early 18th-century Spanish presidio. 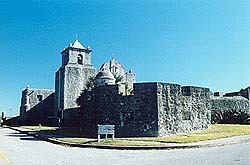 The Presidio Nuestra Señora de Loreto de la Bahia, a National Historic Landmark, is located one mile south of Goliad State Historical Park on U.S. 183. The fort is open 9:00am to 4:45pm daily; closed Thanksgiving, Christmas, New Year's Day and Easter. There is a fee for admission. Visit La Bahia's website or call 361-645-3752 for further information. The La Bahia Chapel has also been documented by the Historic American Buildings Survey.